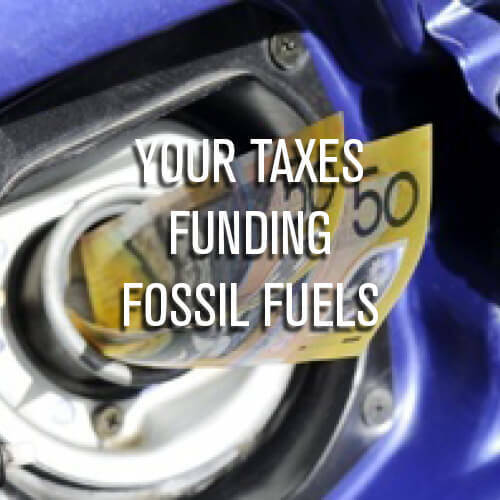 Click the buttons to find out more on how Australia’s government uses your money to prop up dirty fossil fuels. Each year, the Australian government spends billions of dollars of your money on programs that encourage more coal, gas and oil to be extracted and burned. Market Forces estimates that tax-based fossil fuel subsidies cost almost $12 billion a year federally. This includes subsidies that support both the production and use of fossil fuels. But tax-based subsidies aren’t the only government financial backing for fossil fuels. Direct handouts and contributions to the industry are doled out at both federal and state levels. On top of this, public money is used to finance fossil fuels through our national export credit agency EFIC, as well as our involvement with international financial institutions. Seeking to turn rhetoric into action, community and business alike have kept up strong pressure on our politicians to end fossil fuel subsidies. Please sign this Market Forces petition calling on the government to end polluter handouts. Tell Treasurer Josh Frydenberg – End polluter handouts!